Have you found a dinks-designs rock on your travels? Please post a photo of your find, or comment in my 'whats' new' blog, then rehide or keep. I post new rocks in my blog. 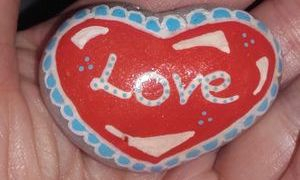 Want a custom rock for yourself? Drop me a message and ill see what i can do. Prices vary. Thanks for sharing the Joy, happy hunting! - Dink.